In the midst of a historic energy industry and market liberalization, Mexico’s federal electricity agency, Centro Nacional de Control de Energia (CENACE), carried out Mexico’s second clean energy auction this week. Participants’ offers to generate solar energy came in surprisingly low in Mexico’s first clean energy auction, which was conducted in March – an average $45.15 per MWh. Offers were even lower for the second auction, coming in at an average $33.47/MWh, CENACE highlights. Fifty-seven companies participated in the auction. Twenty-six were awarded contracts for 56 clean energy projects, representing an investment of some $4 billion and the addition of 2.87 gigawatts (GW) of electrical power generation capacity over the next three years, Mexico Minister of Energy Pedro Joaquin Coldwell reported. Exploring uncharted territory, Mexico’s energy agency is modifying clean energy auction rules as the auction process progresses. Mexico’s state-owned electric utility, Comision Federal de Electricidad (CFE), provided greater incentive to bidders by raising its bid price for long-term power purchase agreements (PPA). Expanding the range of energy generation sources that could qualify for clean energy certificates (CELs) provided another incentive and prompted a wider variety of project developers to participate, including those proposing to build combined cycle gas power plants, CENACE highlights. 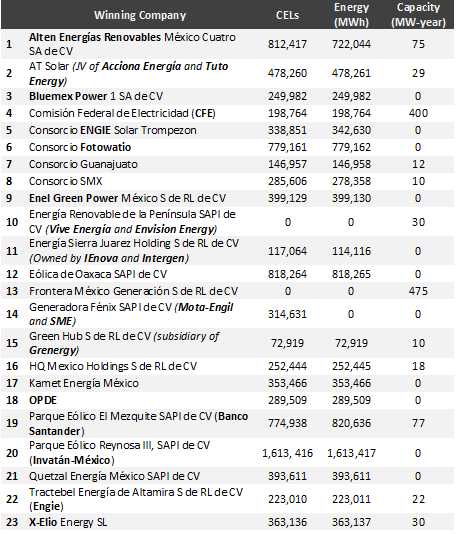 PV solar energy projects still won the most PPAs and the highest shares of CELs. 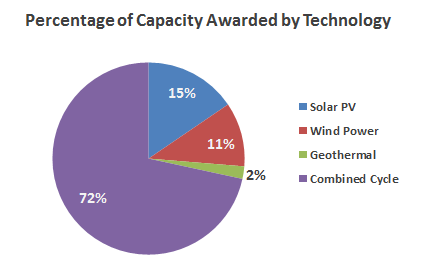 PV solar projects accounted for 54 percent of electricity and 53 percent of CELs. 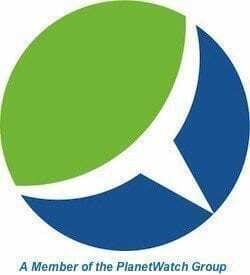 Wind energy again followed – 43 percent of 15-year sales of electricity and 41 percent of 20-year sales of CELs – but a geothermal energy project was awarded a PPA and CELs for the first time, while hydroelectric projects accounted for four percent of CELs awarded. CCGT projects were awarded the lion’s share of 15-year PPA sales – 72 percent. CCGT projects dominated in terms of capacity, however; accounting for 85MW-year of the total 1,187MW-year awarded this year. PV solar ran second and wind power a close third. The auction participation rate was high, as both foreign and domestic groups submitted offers. Overall, PPAs covered 80 percent of the electricity needs of CFE, the only entity permitted to sell and distribute retail electricity. In addition to being the sole transmission and retail distributor of electricity in Mexico, state-owned, vertically integrated CFE for the first time participated in the clean energy auction as a supplier. CFE won a 25MW-year generation contract for the second phase of the Los Azufres III geothermal power plant and won a PPA for its Agua Prieta II CCGT power plant in Sonora. In sum, an estimated $6.6 billion is expected to be invested in clean energy projects that will add more than 5GWs of generation capacity in Mexico as a result of the first two auctions. Thirty-four new power generation companies have been created as well. Furthermore, new power plants will be built in at least 15 Mexican states, which will create substantial numbers of “green” jobs, Undersecretary of Energy César Hernández pointed out.